"Data Center Infrastructure Management Enables You to Maximize IT Infrastructure Value"
The technological platforms such as cloud, big data, telecom industry, and social media are engaging towards better customer service, workforce collaboration, and cost efficient means. It is essential to address the maximizing of IT infrastructure and the efficiency of physical data centre in order to intelligently monitor the availability of resources. 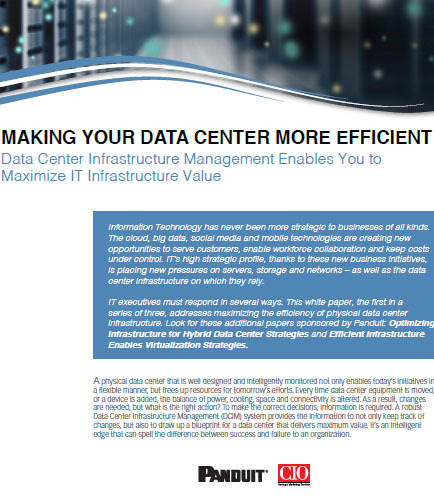 The Data Center Infrastructure Management (DCIM) system allows for an intelligent edge that can spell the difference between success and failure to an organization. Organization that spends efficiently on its resources always gains a competitive edge to its competitors. Does my data center perform to the optimum levels of efficiency? How will DCIM systems bring innovation and competitive edge to my organization? Is the space utilization and connectivity tracking of the data center equipment getting hampered?